I was driving back from Adelaide to the mallee with the rising sun in my eyes when a roo leaped out from the side of the road, giving me no chance at all of missing it. It wasn’t dead at that stage. My friend and I got out of the car and watched the roo in pain until I did the right thing, picked up a big tree branch and hit it on the head until it died. This was surprisingly difficult. There weren’t any passers-by with the kangaroo incident. My mate looked at me and said, ‘Pity to waste it.’ He happened to have a great big knife in my car. He skinned the roo and I cut its tail and back legs off. We dragged the macabre remains some distance into the bush, stuck the salvaged bits in the car and drove home. The kangaroo ended up as a rug, a roo tail soup and enough steaks to fuel a decent barbecue. We were staying at a beach house on the northern shore of Anahola Bay where there is a big reef about 100 metres off shore. The house was generously supplied with toys to play about with in the sea. There was a double surf kayak. I took it out to the reef and spent most of my time in the sea trying to put the kayak the right way up. 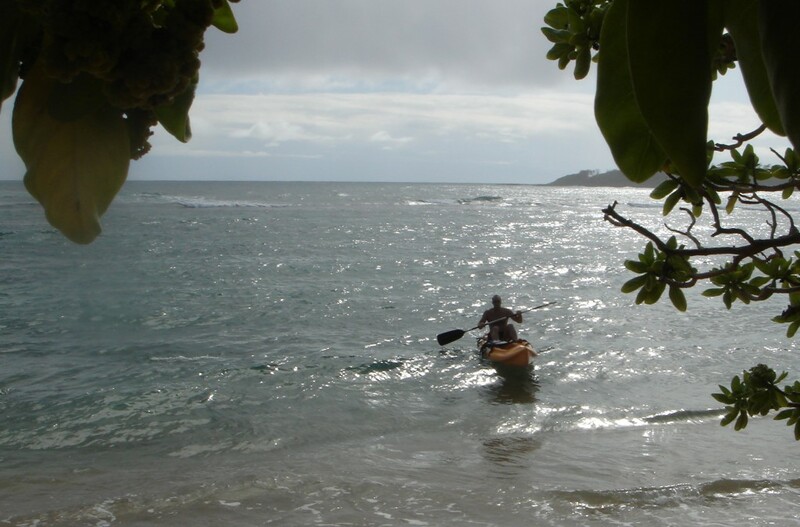 Then I tried to make it through the gap where (if you are any good with a surf kayak) you can get from the sea into the mouth of the Anahola Stream when the tide gets higher than the sand bank that normally covers it. Some experts on the beach watched me roll over repeatedly and eventually gouge out a deep channel into the river mouth using no tools other than my head.